TIBURON, Calif. -- Jordan Thompson appeared to be on his way to an easy victory. The Australian, seeded second, led Marcelo Arevalo of troubled El Salvador 6-2, 4-1 today in the first round of the $100,000 Wells Fargo Tiburon Challenger. Suddenly, though, Thompson began to make errors, and the 6-foot-3 (1.91-meter) Arevalo found the range on his powerful serve and forehand. Arevalo finally prevailed 2-6, 7-6 (2), 7-6 (5) in 2 hours, 32 minutes on a sunny, 68-degree (20 Celsius) day at the Tiburon Peninsula Club, nestled in the hills across the Golden Gate Bridge from San Francisco. "I was not feeling (comfortable on the court), to be honest," Arevalo, 27, said of the first half of the match, his first against Thompson. "I was not hitting the ball clean, but I knew that I need an opportunity to break back and come back. I did when I was 4-2 down (in the second set). I played a better game on his serve and broke at zero. That gave me the confidence to come back. After that, my level went up a lot. I think he started to realize he had the match. It could (have been) like 6-2, 6-1 in 45 minutes." Thompson, 24, agreed with Arevalo. "I lost -- simple as that. I didn't hit many balls in the court, and he started to get better, lifted his game," muttered Thompson, ranked No. 106 after reaching a career-high No. 63 in February 2017. Thompson added that he was not physically or mentally tired after reaching the final of last week's $75,000 Columbus (Ohio) Challenger as the top seed. "Not at all. I wouldn't have lost 7-6 in the third if I was tired. It was cold (today), not very tough outside. I lost by two points. It had nothing to do with (anything) physical," said Thompson, who has "107" tattooed on his chest to signify that he's the 107th player in history named to the Australian Davis Cup team. Also falling today were No. 4 seed Henri Laaksonen of Switzerland and No. 7 Marc Polmans of Australia, leaving No. 5 Michael Mmoh of Bradenton, Fla., as the only remaining seed in the bottom half of the draw after the first round. Tommy Paul, a 21-year-old wild card from Greenville, N.C., defeated Laaksonen 6-4, 6-3. Paul, who won the French Open boys singles title in 2015, is scheduled to face another wild card, Brandon Holt, on Thursday for a berth in the quarterfinals. 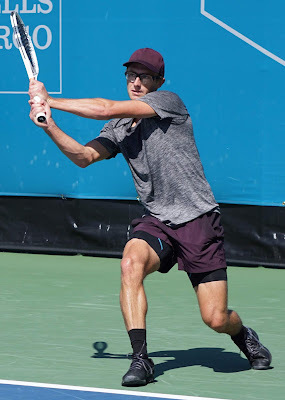 Holt, a USC junior and the son of International Tennis Hall of Famer Tracy Austin, beat qualifier Steven Diez of Canada 6-3, 7-6 (4) for his first Challenger main-draw victory. Alexei Popyrin, a 19-year-old Aussie who won the 2017 French Open boys singles crown, defeated Polmans 6-4, 6-4. Canada's Peter Polansky, the third seed and 2013 Tiburon champion, topped 6-foot-5 (1.96-meter) wild card Tom Fawcett, who completed his eligibility at Stanford in May, 6-4, 6-4. Polansky, 30, served at 1-4, 15-40 in the second set. "That could have easily been the set right there," said the 120th-ranked Polansky. "I went for a couple bigger shots there and just tried to let loose and won that game, which gave me a bit of momentum, and I was surprised to get the break back the next game, but that's how it is sometimes with sports." The 20-year-old Mmoh, coming off the Columbus title, outplayed Darian King of Barbados 6-2, 6-4 in a rematch of the 2016 Tiburon final. King wore down Mmoh, then a qualifier, 7-6 (2), 6-2 in that encounter. Arevalo, ranked No. 192 in singles and No. 59 in doubles, is the best professional player ever from El Salvador. Then again, the Central American nation about the size of New Jersey with a population of 6.1 million has produced only three of them. Miguel Merz -- who moved with his family from Germany to El Salvador, according to Arevalo -- peaked at No. 254 in singles in 1992. Arevalo's older brother, Rafael, retired at 22 because of insufficient financial support and is now the president of the Salvadoran Tennis Federation. Marcelo, also lacking enough money, played at the University of Tulsa (Okla.) for two years before turning pro in 2012. "Then I found my way," Arevalo said. Meanwhile, bedlam reigns in parts of El Salvador. The nation's murder rate of 83 per 100,000 people in 2016 was the highest in the world, the Wall Street Journal reported Friday in a cover story on the epidemic of homicides in Latin America. "Of course, I don't feel proud of that, but I feel like I can't do anything about it right now because what I do is play professional tennis," Arevalo said. "I just go (to El Salvador) a couple of weeks a year to visit my family. I live with my girlfriend in Florida. That's where I spend all the time practicing, and the rest of the time, I'm traveling playing tournaments. "I know it's not a great situation (in El Salvador). There's a war between two gangs, and all the murders you see in the newspaper and on TV, it's all about them killing each other. If you don't go to their places, nothing is going to happen to you." Without his brother, Arevalo probably would still be in El Salvador. "I'm lucky that my brother wanted to play professionally before me, so he was always an inspiration for me," Arevalo said. "After that, it has not been easy, but I really like what I'm doing. I really love the sport. I have achieved a lot of goals, and I want to achieve many, many, many more. I just want to be better every day and hopefully one day become one of the best players in the world." Here are the Tiburon singles and doubles draws and Wednesday's schedule. The tournament is being streamed live.